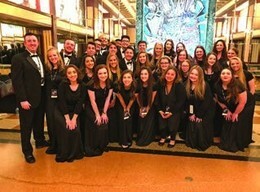 IN WHAT CAN ONLY BE DESCRIBED AS A ONCEIN-A-LIFETIME EXPERIENCE, members and alumni of the Washington Township High School (WTHS) choir took the stage at Carnegie Hall in New York City earlier this month. The school’s choir, consisting of 24 students, was joined by eight alumni members and WTHS Director of Choral Activities Joe Zachowski in the trip to the elite stage. The four-day residency, with 275 singers from around the world, was a result of the Distinguished Concerts Singers International conducted by Grammy-winning composer Eric Whitacre. With two half-days of rehearsals and clinics, the concert resulted in a sold-out show. The WTHS choir received its invitation due to the singers’ quality and high level of musicianship as shown in their audition recording.